To promote bicycling as an everyday means of transportation and recreation. The Orange County Bicycle Coalition is a bicycling advocacy organization (501(c)(3) non-profit) for Orange County, California. Orange County is located between Los Angeles County and San Diego County in Southern California. Commuting and recreational bicyclists formed the Orange County Bicycle Coalition (OCBC) in 1991 to promote bicycling as an everyday means of transportation and recreation. OCBC is explicitly authorized to represent about 2000 Orange County bicyclists who are members of member clubs. Beyond that, we speak for all bicyclists, including the poor, the elderly, and children, and for the bicycle industry. In 1994, OCBC obtained tax-exempt status under section 501(c)(3) of the Internal Revenue code, and has retained that status ever since. 1900 N. El Camino Real, in North Beach San Clemente is the new “clubhouse” for OCBC. 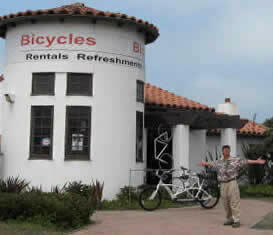 For 16 years, long before he became Executive Director of Orange County Bicycle Coalition, Pete van Nuys would look at the unused Metrolink building at the north end of town and wonder, “When is someone going to put a bicycle rental business in there?” Last December he posed that question to the San Clemente City Manger, who passed it on to the Community Development Director, who sent him a key, and what would become a loooong list of things to do and people to see, not to mention contracts to sign. And in May he got the nod. Every flavor of Gatorade this is. Many coats of paint later this building is welcoming cyclists with cold drinks, energy snacks and, oh yes, ice cream. Also tubes, tires, tools, mirrors, seat packs, locks…. the stuff you need but sometimes forget on your way down to Las Pulgas.